A black and white large format negative of two unidentified women sitting at a table that is decorated. In this view the woman on the left is holding a tea cup and looking forward. The woman on the right is holding a tea pot and tea cup and looking at the woman on the left. This negative has started to degrade. 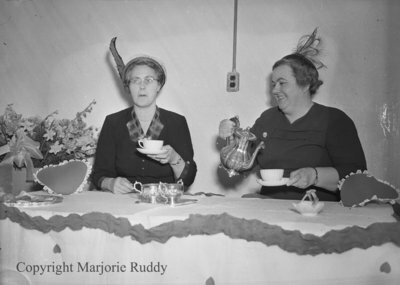 Unidentified Women Having Tea, c.1952, Marjorie Ruddy. Whitby Archives, A2013_040_479.